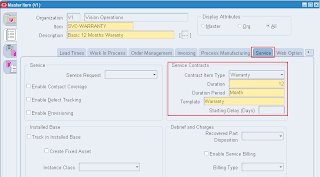 Defining warranty item is not much different from defining service item. We just need to choose few less attribute and associate it with item BOM. Choose your master organization. For me its 'Vision Operations'. 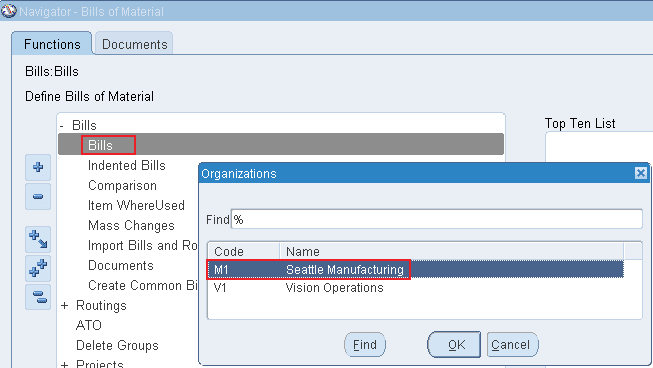 If your organization have already created an item template for service item, apply the template to save time, else follow the details to create it manually. Item Type : Choose Item Type (e.g Warranty etc.). Unit Of Measure : Choose a primary UOM. Please note that we setup service as Time UOM like Year / Month not the quantity UOM like Each. Status : Select an item status which is allowed to be used and not obsolete. Contract Item Type - Select an item type. Since we are creating a warranty item we selected Warranty from list. Period - A period that goes with the duration. Please note that duration an duration period are used in Oracle Quoting for passing service duration for the service item. Coverage Template - Choose coverage template that goes with the service item which you already defined. Note: For serviceable items that are covered by Warranty, you can enter Starting Delay (Days), which will affect the start date for the contract. 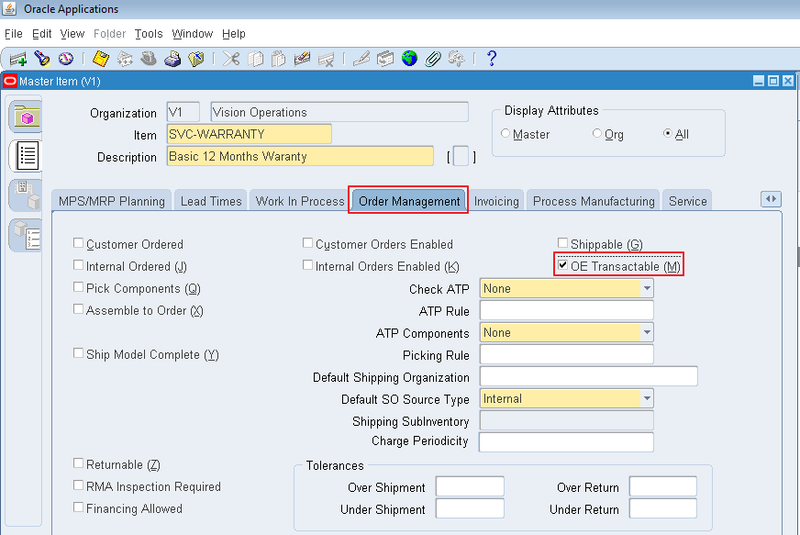 This is used in business cases where after the shipment product takes some time to reach customer and install at customer location The start date for the contract is equal to the ship date plus the value entered in the Starting Delay (Days) field. 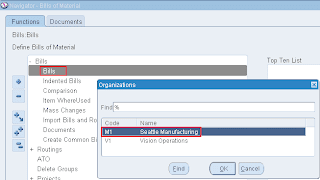 The same date is also used by Oracle Installed Base as the installed date of the product. Note: After a warranty is defined, it must be associated with a serviceable product in the Bill of Materials for a warranty contract to be automatically created. When a product is shipped or manually created in the installed base, the warranty is automatically created in Service Contracts. The warranty is automatically associated with the customer product in the installed base upon ordering and fulfillment of the product to the customer. 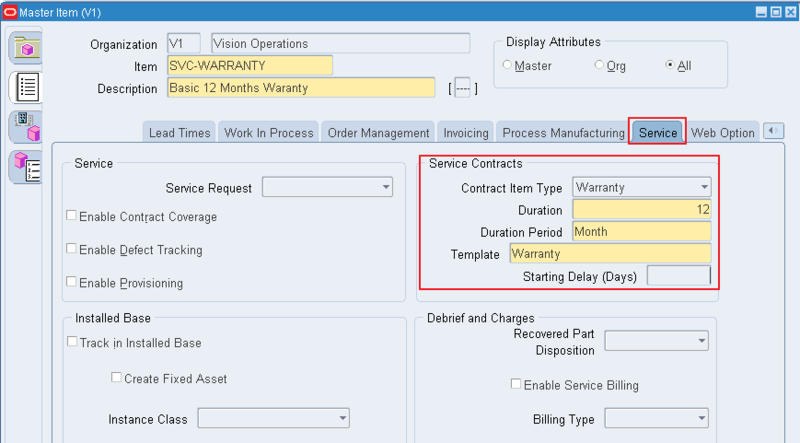 Now associate warranty item to serviceable product so that upon shipment / Installed Base creation warranty gets created automatically. Before doing that make sure serviceable product and warranty item both are assigned to transaction inventory organization. Item : Choose the serviceable product for which you want to associate warranty. Component - Choose the warranty item that you want to assoicate. 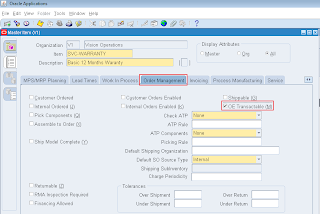 Once you select your item UOM will be pulled as its defined in Inventory. Quantity - Put a value based on the duration of warranty you want of offer on the product. Duration is the value in quantity field with respect to the UOM.